Pasta meets meat meets seafood! 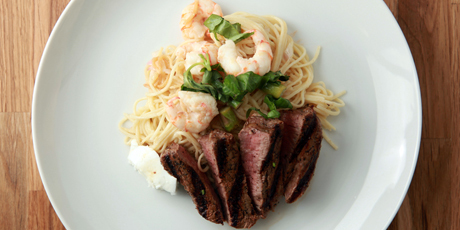 This succulent beef coupled with a seafood spaghetti won't disappoint! 1. Cook pasta in salted boiling water just until al dente. 2. Sweat garlic and shallots in butter and olive oil. 3. Add white wine and lemon juice. 4. Add asparagus tips and stir for 1 minute. 5. Add shelled prawns and stir for 2 to 3 minutes until prawns are pink. 6. Season with seafood spice and ground black pepper. 7. Add to pasta and mix well. 8. Garnish each serving with mozzarella and basil. 1. Cut tenderloin into slices 1 inch thick. 2. Season both sides with salt, pepper and truffle salt. 3. Grill 3 to 5 minutes per side for medium rare. 4. Let rest for 5 minutes. 5. Slice each piece in half horizontally. 6. Serve 2 pieces of beef with each serving of pasta.